Viewpoint For Projects helps you keep your projects on schedule and within budget. 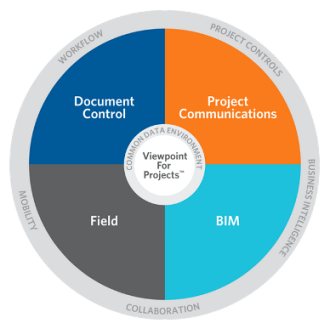 Viewpoint is a document control solution for all of your construction documents such as drawings, submittals, contracts, photos and models. Share, manage and collaborate on documents in one secure, easy to access location. Experience a collaborative work environment for faster project delivery. This browser-based solution enables project teams to easily access, edit, and revise models, providing a complete picture of the project. Easily manage, access, and share large quantities of documents, such as drawings, specification, schedules, contracts, daily logs, and mission critical reports. With mobile capabilities — project teams on job sites can quickly and easily record and capture data, make observations, share and manage documents, raise snags, manage safety walks, and track the progress on projects. Facilitate team collaboration with project communication tools that capture and archive the exchange of information and ideas. Documents can be routed through a customisable review and approval workflow and team members can assign tasks with reminders and alert notifications. Simply fill in your Company Name and Contact Details in the fields opposite, and we will get back to you as soon as possible. Avoid missed deadlines and efficiently manage and track projects. Easily review current version of architectural, structural, and MEP models, either individually or in federated views models. Experience a collaborative work environment for faster project delivery. This browser-based solution enables project teams to easily access, edit, and revise models, for a complete project picture. Designed for use within a live construction project, experience a cloud-based task management tool, electronic forms and process control system that enhances workflow, mobility, and communications.